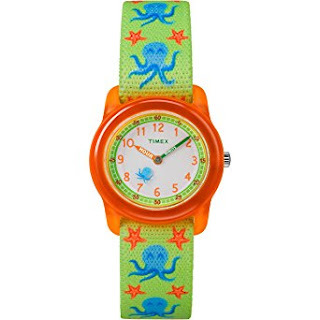 7 Kids and Us: Timex Time Machines Learning App and Watches for Kids! Timex Time Machines Learning App and Watches for Kids! This past year in our home school co-op one of the moms came to me who was teaching math and asked me if my son could tell time on a watch. I said yeah I think he can, sort of and she handed me a pack of flash cards and said "work with him!". I was more than slightly embarrassed. He is 10. He should be able to tell time. I know he can say what time it is, by looking at his phone, its not like if its 12:30 he says "twelve three oh" he knows how to say it, but as far as analog reading of time was concerned he didn't really get it, and from what it seemed, most of the other kids in his class did. When we got home that day I was on a mission to teach him to tell time on a watch, so when I googled...I found something great. Timex Time Machines. Timex, a global leader in timekeeping for over 160 years, launches Timex Time Machines Mobile App developed with Scholastic the global children's publishing, education and media company. Made just for kids in grades 1–3, Timex's Time Machines mobile app give educators and parents the tools they need to make time teaching fun, easy, and hands-on. 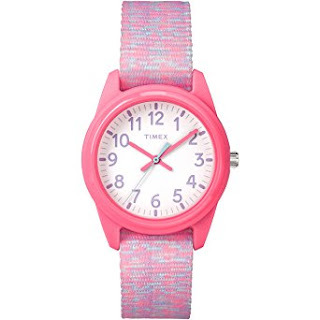 Timex Time Machines watches are durable, easy-to-read and come in an assortment of colorful, fun designs kids will adore. Developed with Scholastic, the Timex Time Machines Mobile App empowers kids to have fun through learning by seamlessly blending digital free-play with a variety of interactive lessons tailored for kids ages 5 through 9. Learning mode – learn to tell time with a tutorial that features general concepts such as clockwise, counter-clockwise, function of clock hands, telling time, A.M./P.M., and a simple game analog and digital matching game. Game Mode LEVEL 1: Time Stopper - The clock is spinning and the player is given a time. The player must tap the clock at the specific point when its hands are at the indicated digital time in order to stop it. Game Mode LEVEL 2: Counting Time - Players see a clock with a certain amount of time shaded in (for example, a quarter hour). They must tap minute buttons to equal the shaded amount without going over. Game Mode LEVEL 3: Rocket Time - Time, in the form of clock faces, is falling from the top of the screen toward the player's Time Machine. The player must tap the clock that matches the written time shown at the bottom of their screen. So how does it work? You download the app, play the games, and use the Timex Time Machines watch to help you learn. What I love about the watch, is that the hands on some of the watches are labeled "hour" and "minute" so there is no confusion. I have found this to be REALLY helpful with my son when it comes to telling time. He is excited for school to start in the fall so he can go back and show his math teacher what he has learned! The mobile app is available to both iOS and Android users and is available, free of charge and ad and commercial free, for download in the Apple App Store and Google Play Store.